It was a hot Summer's day right after Sunday hockey. 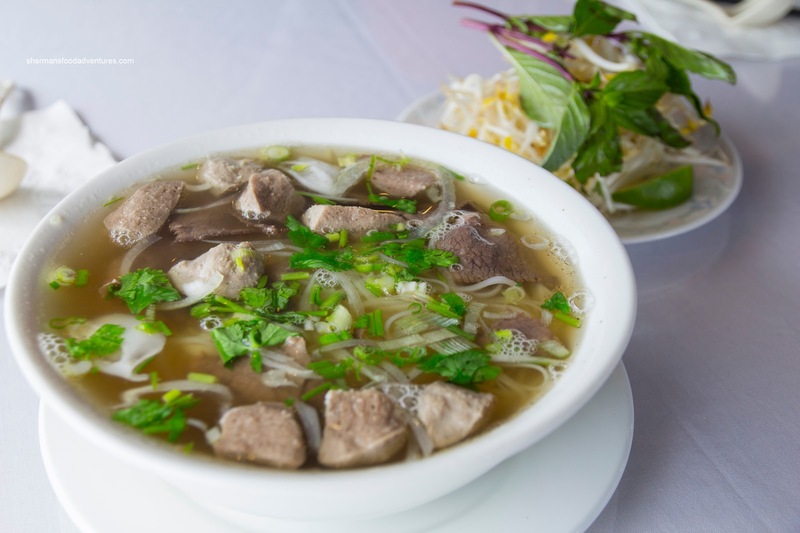 A perfect time to visit a non-A/C Vietnamese restaurant for some steaming hot Pho right? Well, I'm pretty sure that's how they do it in Saigon, so why not here? At least we are a good 10 degrees cooler! 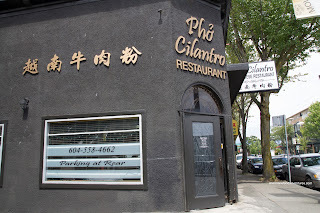 In reality, that was not really out intention, but alas, our eating adventure was Pho Cilantro which was sans climatiseur. We strategically sat near the door which was slightly ajar to catch whatever breeze that decided to enter the restaurant. 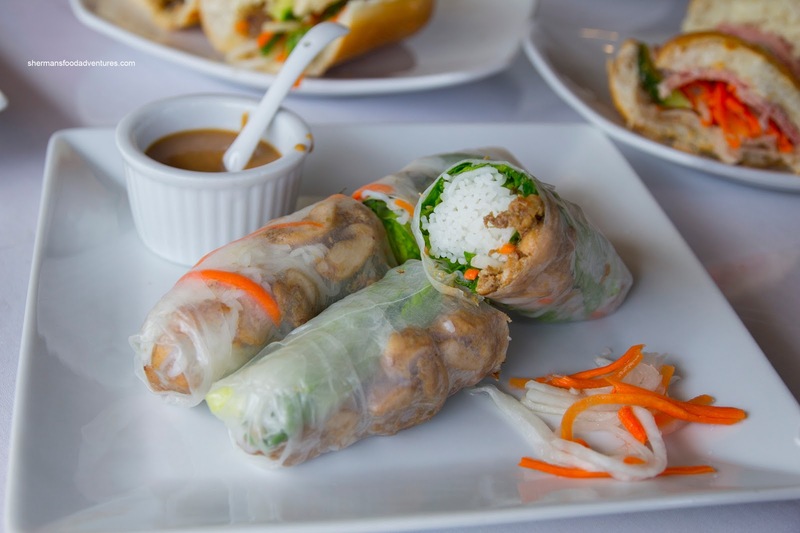 As with any meal with JuJu and Milhouse, we ordered far too much food starting with the Lemongrass Chicken Salad Roll. This was well-constructed with crunchy veggies, firm noodles, basil, yet unfortunately dry chicken. The chicken did taste good though while the rice wrapper had a nice elasticity. 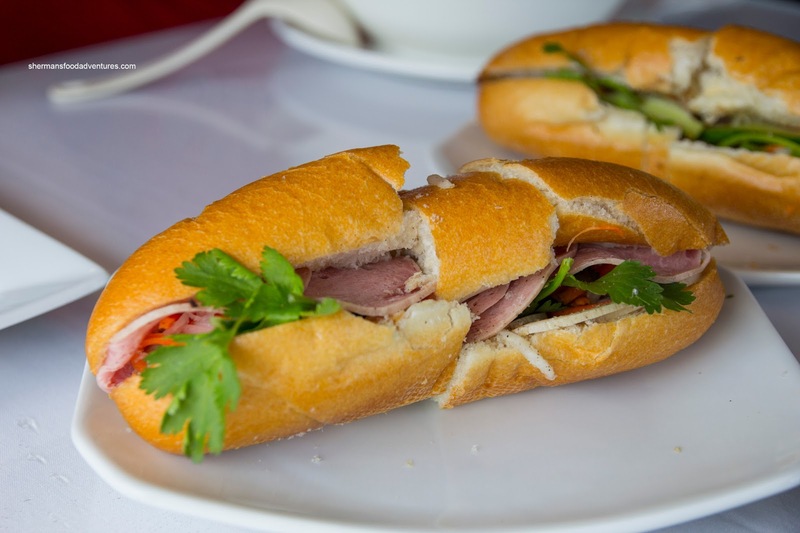 We got a couple of Bánh Mì sandwiches including a grilled pork and the one pictured, cold cut. The bread was really crunchy and crusty. It was a bit big for the amount of ingredients though. We found that the cold cut needed more pate as there was only a small streak of it. As for the grilled pork, once again, there was flavour, but it was dry. For my main, I had the Bún Bò Huế which was super flavourful. It had hints of lemongrass, plenty of chili oil, ginger, fish sauce and a healthy dose of MSG. Unfortunately, the noodles were really soggy while the meats were chewy (except for the Vietnamese ham). Also, there was no pork blood nor knuckle. Milhouse had the Phở Chín Bò Viên which was also super tasty. Lots of meat flavour, sweetness and licorice hits (from the star anise). However, much like the bun bo hue, there was plenty of MSG. The noodles were okay here, but some of the meats could've been more tender. JuJu had the Grilled Beef and Spring Roll Vermicelli where the beef was really well-seasoned, but really dry as well. The spring roll was crispy, however, the filling was dry and mealy. Since I was hungry, I also had the Lemongrass Chicken and Fried Egg on Rice. Similarly to the salad roll, the chicken was dry and hard. Yet as with everything else, it had plenty of sweetness, lemongrass and all the good stuff (MSG?). Of note here, the server neglected to bring us any cutlery for these 2 dishes. In fact, when we were about to order, she rolled her eyes in disgust as JuJu headed to the washroom. Me thinks she dislikes her job and customers. 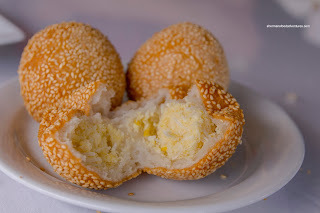 Lastly, we decided to try the Bánh Rán or Vietnamese "donut" filled with coconut and mung bean. It is very similar to the Chinese Jin Deui. These were crunchy, not greasy and not very sweet. This was a nice way to end our meal, but the service or lack of was a little annoying. We never got checked on and asking for anything was a chore for the server. The rolling of the eyes was not cool either. Furthermore, there was a big issue with the food as the proteins were mostly dry and chewy. Lots of potential here, but not quite there yet. Been there twice. I thought the fried rolls were quite good, if nothing else stood out. The space and room is comfy. Service slow, but not un-friendly at least when I was there. 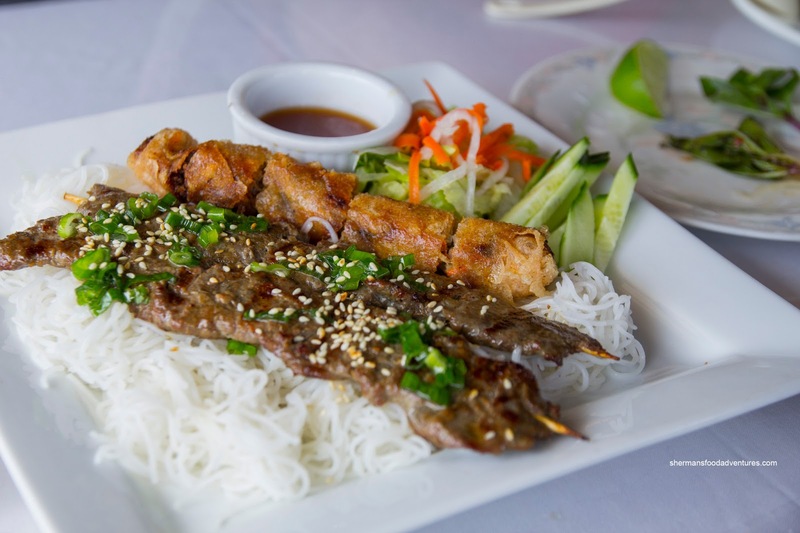 The presentation look pretty fancy for a Pho restaurant. 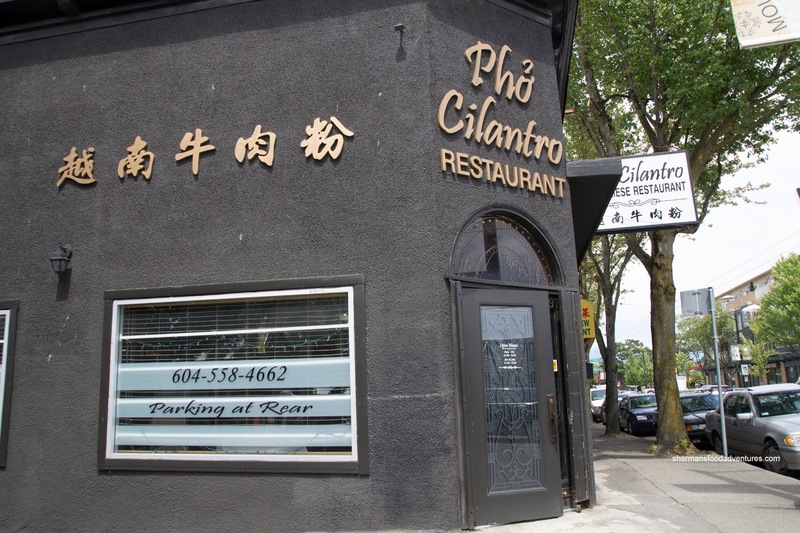 Would you say they're a bit pricier than the average Vietnamese restaurant? 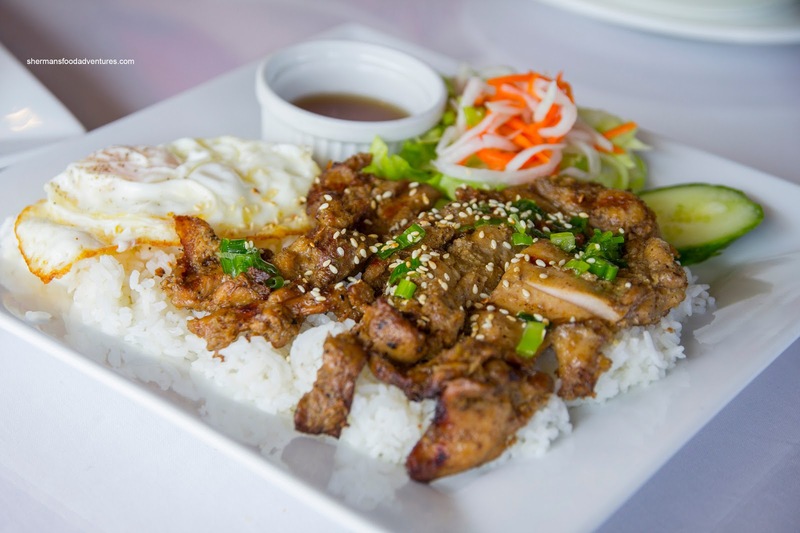 @Foodbuttal - actually I've noticed many Vietnamese restos' prices crept up this past year, esp. after the demise of the HST. 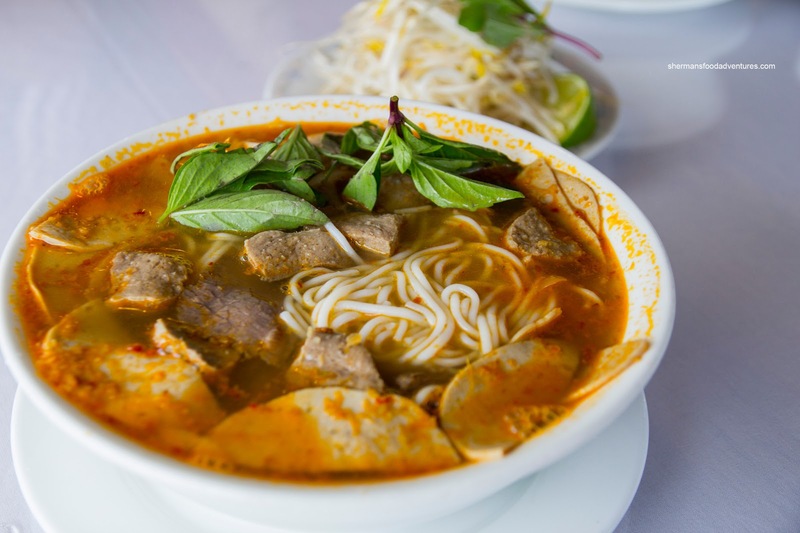 @lotusrapepr - I know what you mean, a couple years ago I could get a decent bowl of Pho for ~$7.00after tax. Now they're charging $8.00 or more before tax, otherwise they'll skimp out on the toppings.